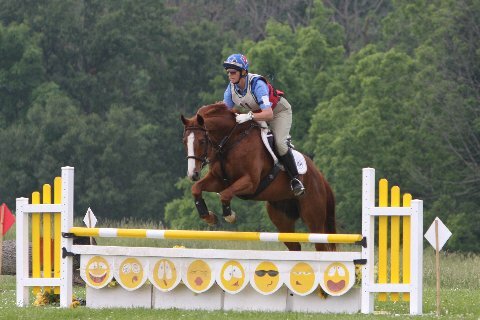 The course at the schooling show called for jumping a single vertical, roll back left to another vertical, bending line to an oxer, then left to a vertical with a big puddle that strongly suggested it be jumped well left of center. After that another rollback left. It was about 90 degrees with high humidity and I’d done a pretty good job of keeping myself and my horses hydrated and well rested. I was pretty proud of myself for finally implementing the plan to keep us all doing well. My dad, a dairyman in his youth, always said, “Take care of the stock before you take care of yourself.” That’s a really good plan until the person taking care of the stock passes out from heat exhaustion and then there’s no one left to take care of the stock. My Dad was great and I still love him silly, but I’ve lately subscribed to the flight attendant mantra: put on your own gas mask first before assisting others. So gatorade, water and snacks are always with me at horse shows and I take them in freely at the same time my horses are refreshing themselves. So I can’t blame what happened at the schooling show on dehydration or heat exhaustion, but it makes for plausible shorthand if needed. The real story is a little more involved and more fun. We were doing the training level combined test. Dressage had gone well, with my up-and-comer, Sammy, coming within a point of my prelim horse, Eddie, who was doing the show mostly on a tune-up lark. I was delighted with both of their tests. On to showjumping. Since it was a small schooling show, it was my choice which of the horses to ride first. I decided to ride Sammy, since I would have a little more time to warm up the first horse I rode. I was the only entrant at that height, 3’3″, and it turned out I was the last to go in the only ring that still had classes running in it. The show staff were politely, but periodically, looking at their watches. I had both horses tacked up and ready to go when they had the course set, and a friend was holding Eddie while I rode Sammy. I entered the ring after a brief warmup and Sammy felt great. He picked up a lovely balanced canter, the buzzer sounded and off we went over fence one. Roll back to fence 2, bending line to the oxer, no sweat. Turn left to the puddle fence, where the trouble began. I hadn’t walked the course because 1) the footing at the show was generally great, despite the 2″ of rain that fell overnight; 2) I was confident in my horses at the height, and 3) I didn’t have opportunity to walk the course due to having ridden another dressage test on Eddie for practice at 2nd level just minutes before. Those are my excuses and I’m sticking with them. So now I was faced with jump 4 and the big puddle. The obvious solution was to jump it left of center, from the beach, rather than the tidewater. I asked Sammy for a few steps left in canter, a cross between half pass and please-get-left-quick-horsie. He was fabulous about it, kept the rhythm, jumped neatly out of stride and we landed, yay, and having accomplished that, I immediately blanked regarding what the next fence might be. The puddle had surprised me and I’d used all my available brain space to get the horse to a good spot to deal with it and I could not for the life of me think where to go next. At one point early in my riding career, faced with the same difficulty of having no living clue what the next fence was, I’d actually stopped the mare I was on to take a quick look around, figured it out, picked up a canter and finished the course. I thought I was so clever to buy myself some time! I quickly learned that stopping, even unrelated to a fence, was counted as a refusal in showjumping. D’oh! The agony! An honest-to-the-TD, skidding, rail-splintering crash of a refusal is one thing, but being assessed the penalty for a refusal without a really good story is just not palatable. So, rather than go wimpering down in a mewling penalty at this show, I figured I’d canter on and look about for a likely candidate that might suffice for jump 5. Well, lookee here, straight ahead, nice square oxer and I’ve got a nice canter going. What a bonus. One stride later it dawns on me that there is no ground line on this side of it, and it isn’t square, it is slightly ascending, from the other side. At moments like this I tend to simply keep doing what I’m doing and think at light speed. So in the next stride, the thoughts that went through my head were: 1) I should pull him off, that is obviously not the right fence; and 2) but this is a really fab canter and the distance is perfect, it will sail; and 3) he’s a relatively green horse and this is a schooling show, so I don’t want to pull him off and give him a jar; and 4) he’s a relatively green horse so I should not ask him to jump a ground line-less descending oxer; and finally came to the conclusion 5) hell with it, Lucinda Green jumps ascending oxers backwards as a matter of course in her training and Sammy’s been jumping bigger than this without a groundline at home and what does he care if it is a descending oxer, he’ll land 8 feet on the other side anyway. Sure enough, he cantered down to it and sailed it very nicely. And I rode the next few strides waiting for the whistle signaling my off course-ness and at the exact instant it went off, I came to the brilliant realization that I should have turned left after fence four and rolled back left to fence five. D’oh. I asked for and received permission to continue, and finished the course just fine. Sammy never knew he was a victim of pilot error. There was no hint of it in the party I threw for him when he crossed through the finish flags. So I’m thankful that the people who educated me about riding and showing pounded into my thick head the habit of always schooling at a more difficult level than I show. We all make mistakes or get surprised by things that happen in competition, and it is nice to have a little more horse or a little more training in my horse than I need to respond intelligently to the questions that come up in a competition. I don’t go off course often and I don’t intend to do it again for a while, but it sure was fun cantering down to that oxer knowing it would go well, knowing I’d be eliminated for doing it and knowing I didn’t have to pull my horse abruptly off the fence and confuse him, because it was going to go fine. His experience at home had allowed me the option of pitching the class rather than his confidence. So, yeah, I jumped the oxer backwards. And it was fun.